April is underway and the first Triple Crown weekend of the season is upon us with the running of the KRA Cup Mile at Busan. The formidable looking quintet of Doraon Hyeonpyo, Rafale, Mac And Cheese, Summit Myeongun and Yeongcheon Ace head the field while the hope that Seoul’s two entries were actually some form of Korean racing April Fool’s Day joke have been dashed. See below for a full preview of the big race. April also sees the shifting of Friday racing at Busan to a later start time with the first race now being 12.50 and the last 19.00. This will be the case for the next four months. Busan Racecourse: 10 races from 12.50 to 19.00. 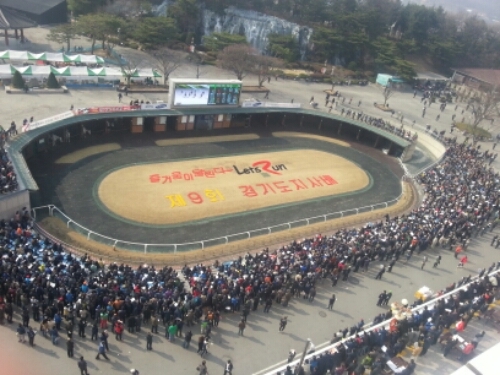 Seoul Racecourse: 13 races from 10.50 to 18.00. Jeju Racecourse: 9 races from 12.20 to 17.10. Seoul Racecourse: 10 races from 10.50 to 18.00.